This concise and engaging book will teach you how to cut through the complexity of any business, and will get you thinking like a CEO in no time. Have you ever noticed that the best CEOs seem to have a special kind of intelligence, an ability to sense where the opportunities in their industries are and how to take advantage of them? The best have a knack for simplifying the most complex business practices down to the fundamentals – the same fundamentals of the small family business. 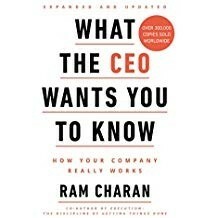 In What the CEO Wants You To Know, Ram Charan explains in clear, simple language how to do what great CEOs do instinctively and persistently – understand the basic building blocks of a company and use them to figure out how to make it work as a total business. Being able to decide what to do when, despite the clutter of day-to-day to-do lists and the complexity of the real world, takes the mystery out of business and offers a clear road map of organisational success.